Do you have just a little bit of space at your workplace? We invite you to host one of our highly visible, bright orange collection balls and you will be amazed at just how simple it is to make a very positive difference to South Australians living with a disability. 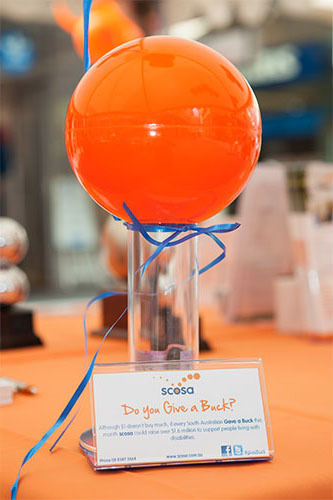 All you have to do is give the scosa donation ball a fabulous home in a high traffic and easily accessible area of your premises, such as on your front counter bench top. A scosa uniformed volunteer will visit to drop off a ball and from there, check in occasionally to say a quick hello and swap the donation ball over with another ball to start collecting again. It costs you nothing and is so easy! Ideal locations include fish and chip shops, cafes, hotels, restaurants, fruit & veg shops, delicatessens, bakeries and the like.